“With Bruce, you had to pound and you had to swing. And that’s still true. I just got better and more nuanced as time and touring with him went on," said Weinberg. With Bruce Springsteen hanging out on Broadway through the rest of 2017, his loyal collaborators in the E Street Band are currently hitting the boards on their own. While saxophonist Jake Clemons and guitarist Little Steven Van Zandt are relatively new to the game (Van Zandt hasn’t played under his name in years), drummer Max Weinberg is an old hand at the solo life. “I think I’ve always tried to make a role for myself apart from Bruce,” said Weinberg, on a rare day off from his new Jukebox Tour, whose Philly date at World Café Live is tomorrow night. That would seem the case, considering that Weinberg wrapped up his most recent year-long tour of duty with Springsteen – The Boss’ revisiting 1980’s “The River” with record-breaking 4-hour-plus shows – at the end of February. Now, here the drummer is, six months later, gathering a quartet of crack musicians together to play Weinberg’s favorite rock songs from his youth. Does Weinberg not like hanging out at home? Remember too, Weinberg led his own large-scale, big band on a daily basis, first on “Late Night with Conan O'Brien,” and then on “The Tonight Show with Conan O'Brien,” from 1993 to 2010. There, Weinberg backed musicians, singers and performers as diverse as Barry Manilow, Beck, and Will Farrell. “That’s a gig that really broadened my chops and made me more comfortable fronting my own bands,” said Weinberg, a drummer who had already grown up with a variety of rhythmic influences such as Buddy Rich, Elvin Jones and Keith Moon. “When I first hooked up with Bruce, he used to encourage me to play like Moon,” said Weinberg, of The Who’s late, great drummer. His love and admiration of Springsteen and his work as a musician and a composer is apparent when speaking with the drummer. Ask Weinberg if he’s witnessed the “Bruce on Broadway” experience, and he says “yes” with great brio. “Last Thursday with my wife I caught Bruce’s show,” enthused Weinberg. Weinberg says that his “Jukebox Tour” is a feel-good romp through rock n’ roll’s last six decades. Not only will the shows trigger an audience’s sense of its collective past, but there is Weinberg’s feelings of nostalgia and love of the classic rock and pop songs of his youth to consider. Weinberg will put the selections on a video monitor and the crowd will select the songs, “just like a jukebox,” he said. Though the drummer swears by his entire selection of classics, he does have his favorites. They include The Who’s “I Can See for Miles” and Chad & Jeremy’s “A Summer Song.” Weinberg also digs playing with a crack batch of musicians. “I like to find guys who play Beatles songs as a thing,” says Weinberg of his pals, The Weeklings (Bob Burger, Glen Burtnick, John Merjave and Dave Biglin). Talk to Weinberg about playing Philadelphia this Tuesday, and he again mentions nostalgia. He has family in the area, and his roots with Springsteen can be traced to Philly. 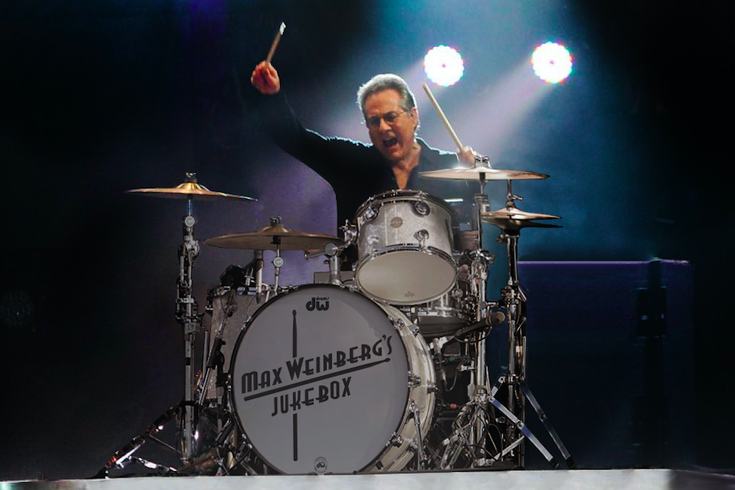 Max Weinberg’s Jukebox Tour appears Tuesday, October 17 at World Café Live, 3025 Walnut St. Tickets are $55-$45. Show time is 8 p.m. For more information, call 215- 222-1400, or click here.